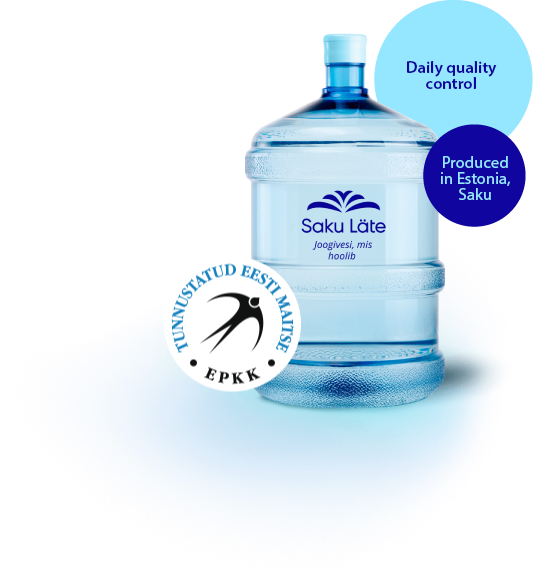 Saku Läte drinking water is bottled from natural ground water unique for its pure taste and has been awarded the ‘Approved Estonian Taste’ label. Numerous homes and offices have opted for Saku Läte drinking water as their daily source of refreshment. The conformity of the quality parameters of Saku Läte drinking water to established limit values are ensured by daily measurements taken by the Estonian Health Board and monthly tests of ground water and finished products performed by the Environmental Board. Keep water bottles and the water dispenser out of direct sunlight and in places that are not too close to heaters. Mind the ‘Best before’ date on the bottle cap. Only use Saku Läte drinking water for Saku Läte water dispensers. At the service points, the price list set by the dealer applies to drinking water from Saku Läte.